Hello all! I am so thrilled to have Prudy from Butter Basil & Breadcrumbs sharing this truly elegant recipe for her Raspberry Rose Sorbet in Floral Ice Bowls. Yes, folks... Floral. Ice. Bowls! I can’t tell you how thrilled I am to be writing this guest post for Carrie…and when she asked if I’d be interested, there was absolutely no hesitation before I said yes! I immediately knew that I wanted to make something refreshing and summery for her. It didn’t take me long to decide on Raspberry Rose Sorbet in Floral Ice Bowls. Sorbet is one of my favorite things to make during the summer- it’s quick and easy and always a special treat no matter how many times you serve it! And now with the warmer weather finally here, we will all be craving and searching for something that is refreshing, possibly something icy to help us cool off on those hot days. This sorbet is not only the perfect cure for those hot days, but it’s so, so delicious. Honestly? I have eaten more raspberry sorbet in the last couple of months than I care to admit, but I’m not sorry for it. It’s just that good! “Mike, try this for me” I said to him. “I’m not eating that” he answered. “Oh my gosh, just taste it” I answered, a little bit on the cranky side. “What’s in it?” he asks. “Just raspberries and sugar!” I answer a little louder and crankier, not mentioning the rose water, knowing full well that would be the end of the conversation. He takes a spoonful, but with the facial expression as if I’m serving him cyanide. “This is delicious” He says. “No kidding” I answer, walking away, rolling my eyes… but secretly thrilled that he loved it! Mike is fussy, but there is nothing fussy about this sorbet…just a few ingredients, and very little work involved! …And I should mention that it’s really good when it’s in “slush” mode too…so if you want to drink this sorbet, stop your ice cream maker when it hits that slush-icy mode, and pour it into a tall glass. Better yet, top it off with a little Chambord, vodka, peach schnapps, or champagne! Throw a slice of peach and a couple of fresh raspberries on top and one of those pretty striped straws into it, and call it your new favorite drink! You know… I always thought that sorbet was more of a newer trend. I say “newer” even though it’s been around for years… I just didn’t realize that it’s been around for thousands of years. We can thank Roman Emperor Nero, who decided that he wanted frozen honey and wine (hmmm…something I need to try? ), so he positioned his runners along Appian Way (the very first main road in Rome), where they would pass buckets of snow hand over hand to the banquet hall to mix with the honey and wine. I would totally eat/drink slurp wine and honey mixed with snow… I would have even handed a few buckets of snow down the road just to get it done faster! I decided to make the ice bowls to go with this, to show just how functional, yet pretty that they can be at the same time. On a hot summer’s day, an ice bowl is so perfect to serve frozen treats in, because it keeps them nice and cold, they don’t melt as fast. (Of course, you’ll want to serve the ice bowls in a regular bowl, purely for “hand comfort”). Add some edible flowers to them, and they’re pretty enough to serve to your most honored guests at your next get-together! 1 tsp rose water (Trust me, a little goes a long way!) Worried about the rose flavor? Use vanilla instead! In a small saucepan, combine the sugar and water. Bring to a boil over high heat, stirring just until the sugar is dissolved. Reduce the heat to low, and simmer for five minutes. Remove from heat, and stir in the rose water. Simple syrup can be refrigerated in a covered container for up to two weeks. Puree the raspberries in a blender or food processor until smooth. Press the puree through a fine sieve into a bowl, and discard the seeds. Stir the simple syrup and lemon juice into the puree, and place the bowl of puree into the freezer for 30 minutes. After the 30 minutes, pour into the ice cream maker, and freeze according to the directions. Mine took about an hour to freeze. I put it into a freezer container afterward, and placed it in the freezer for about another hour so that it was hard enough to scoop. Place the smaller bowl inside the larger bowl, and wrap the tape over the top to hold the smaller bowl in place (once the water is poured in, the smaller bowl will want to float). Pour enough water into the 3/4” opening until it is about half filled. Begin placing your flowers and herbs, using a chopstick or skewer to push them down into the 3/4” space. I found it easier to put the thyme tucked along the sides and over the top of the flowers, to keep the them from floating to the top of the bowl. Once your flowers and herbs are in place, pour enough water over the flowers to fill the bowl to the brim. Place in freezer until completely frozen. Once frozen, remove the tape, and run the water from your faucet at a light trickle, lukewarm. Let the water trickle into the smaller bowl, and let it sit for a couple of minutes. The smaller bowl will release within a minute or so. Try not to run the water over the actual rim of the floral bowl, as it will melt. Once the smaller bowl is released, turn the larger glass bowl upside down and let the water trickle over the bottom of the bowl, with your hand underneath to catch the floral bowl as it releases from the glass bowl. Believe me, making them is much easier than it sounds!! Serve your favorite frozen treat or fruit in your fancy frozen bowl! Enjoy!! Just a quick note: Please don’t shy away from making the ice bowls- they’re so easy to make, and they don’t take as much time as you’d think! You’ll just need two different size bowls and some extra room in the freezer for them, so prepare ahead for that. I know that I really don’t need to mention this, but I would make sure that the flowers are edible. Seriously- don’t use Lily of the Valley, or buttercups, or anything like that! If you’re unsure about a flower, please..please Google it! I have to say that you should try to serve this the same day that you make it, unless you have a really good ice cream container. It’s good the next day, but it’s does turn really hard and icy if left in the freezer overnight. It’s still good to eat, but it’s more like a popsicle by then. So seriously? If you have leftovers? Pour them into a popsicle mold, and enjoy! And honestly.. You don’t even need an ice cream maker. 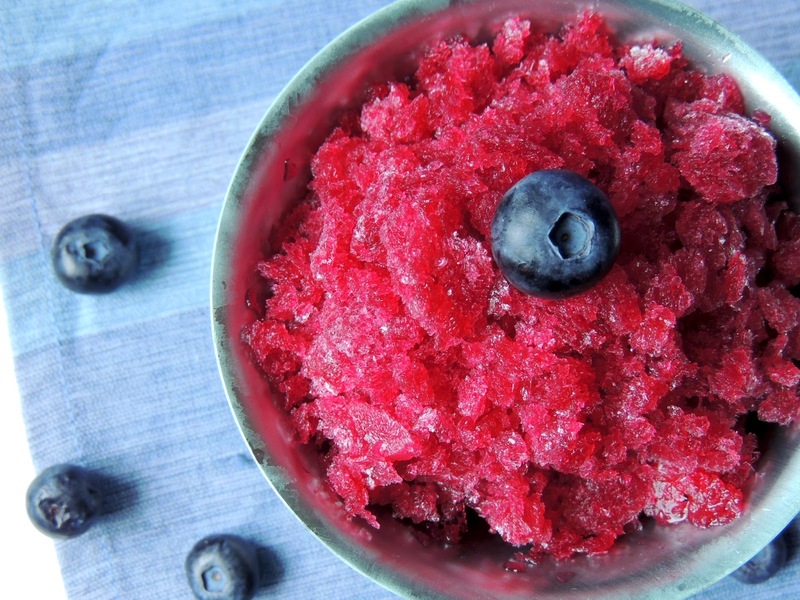 Just throw this mixture into the freezer, stir it once in a while, and then when it’s frozen, just scrape it with a fork and serve as granita…which the only difference between that and sorbet is the way it’s frozen. It’s just that simple! Remember to put your ice cream maker bowl into your freezer the night before! A special thank you to Carrie for giving me this wonderful opportunity. I’m thrilled that you thought of me, and so honored to write this post. It has been a pleasure. Truly a pleasure. Hello! 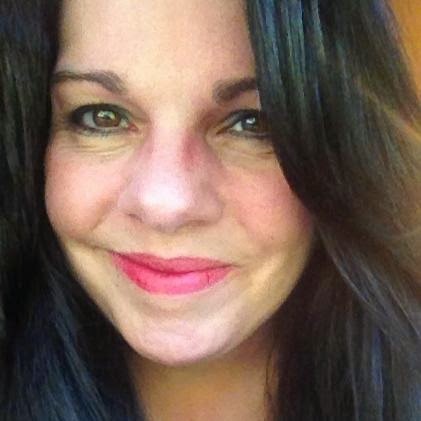 I’m Prudy Blank… I live in Wheatfield, NY with my three grown kids, Katie, Jess, and Mike… and my black lab, Sophie. I’m not a chef, but I’m just a girl who loves to cook. I count on my own, my family’s and my friend’s taste buds to let me know if it’s a win or fail. Let's be honest here... things happen in the kitchen, and I've had my share of failures! Failures can’t ever stop me….they just put me on a mission to perfect that recipe! …And I won’t stop until everyone is smiling! You can find Prudy sharing all of her tasty recipes over at Basil Butter & Breadcrumbs.